Financial Poise™ Editorial Board Chair, Ron Diamond, was the featured speaker at the Family Office Deal Flow Summit on March 28, 2019. 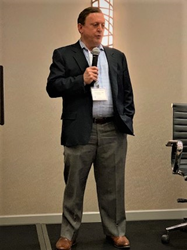 Ron Diamond was the keynote speaker at the Family Office Deal Flow Summit on March 28, 2019. Financial Poise™ is pleased to congratulate Ron Diamond, Chair of The Family Office Advisor, a Financial Poise™ editorial board and CEO of Diamond Wealth Strategies, who was honored as the Keynote Speaker at the Family Office Club’s Family Office Deal Flow Summit on March 28, 2019. Mr. Diamond, a highly regarded speaker on family offices, presented “How and Why Family Offices Are Disrupting Private Equity, Venture Capital, and Real Estate” at the Chicago Summit. Diamond noted that he was "honored to deliver the keynote about how and why Family Offices are disrupting private equity, venture capital, and real estate. " The Family Office Club’s Family Office Deal Flow Summit is an invitation-only event that brought together leading family investors with off-market deal flow for networking and deal-making opportunities. The Summit, a one-day event, took place on March 28, 2019 in Chicago.